In Un Coup de Dent, renowned artist and activist Nancy Spero will present a body of early, expressionistic works referred to as the Black Paintings and a group of related drawings, created between 1954 and 1965 and exhibited comprehensively in the United States for the first time since 1985. Romantic, nightmarish, and mythic, the Black Paintings’ emphasis on the female figure as protagonist and the overriding emotions of pain and dissonance prefigure Spero’s preoccupations for the next 40 years. Un Coup de Dent will open to the public on January 2, with the opening reception to be held on Thursday, January 8 from 6 to 8 pm. The subjects in the Black Paintings and their related works-on-paper are lovers, mothers and children, and amorphous, looming creatures—figures allusive of existential oppositions and emotional turmoil. Somber, figurative works made at a time when Pop Art and Minimalism were the main focuses of the art world, the Black Paintings preface Spero’s radical career. Spero worked on the paintings over long periods of time, often at night. Broad, unmeasured strokes of dark oils surround and obscure the figures, enveloping them in a way that is both sensual and haunting. Coded references to the dominance of male painters in the American abstract expressionists are also visible. themes for which she is now known would take shape. Pioneering and critically lauded works of Spero’s career include the frieze-like scroll installations such as Cri du Coeur and Azur; large panels such as the Codex Artaud series and Notes in Time on Women, and the stark, impulsive War Series and Artaud Paintings. The Black Paintings present fascinating insight into Spero’s practice, evoking a union of European civilization and history with the raw and uncompromising beauty of contemporary American painting. 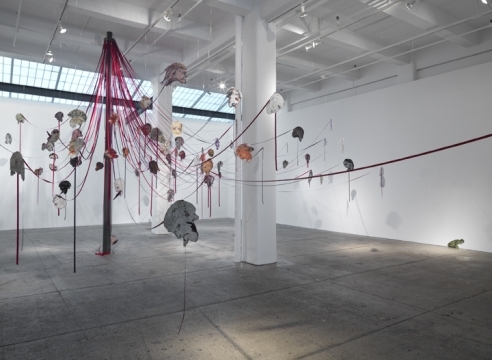 Nancy Spero’s works can be found in over 40 museum collections worldwide, including the Museum of Modern Art, New York; Whitney Museum of American Art, New York; Tate Gallery, London; National Gallery of Australia, Canberra; Museo Nacional Centro de Arte Reina Sofia, Madrid; and Musée National d'art Moderne Centre Georges Pompidou, Paris. Currently on view at the Reina Sofia is Nancy Spero: Dissidances, Spero’s largest retrospective to date, organized by the Museo d’Art Contemporani de Barcelona and traveling to the Centro Andaluz de Arte Contemporáneo in Seville. The artist is also currently featured in WACK! Art and the Feminist Revolution at the Vancouver Art Gallery, its third venue.